The Henderson Beach Resort is a timeless, elegant seaside manor located on the pristine white sands of Destin’s stunning Florida Gulf Coast. Featuring an award-winning Salamander Spa, The Henderson is designed to connect guests with the natural beauty of the Gulf Coast and is adjacent to the 208-acre, environmentally protected Henderson Beach Nature preserve, which offers both serenity and a host of activities. 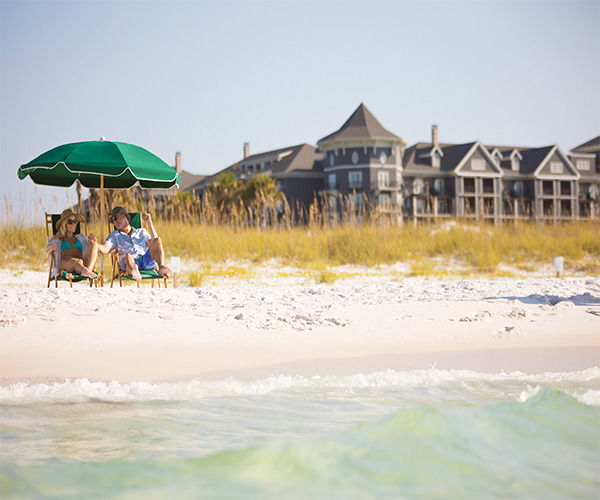 Each of the resort’s beautifully appointed guest rooms has a sweeping view of the resort’s spectacular setting: emerald-green waters of the Gulf of Mexico and the adjacent nature preserve, shimmering pools, the gabled rooflines of charming Crystal Beach cottages, or the resort’s lush gardens. Chefs at Henderson’s five restaurants–which range from poolside casual to fine dining with an ocean view– create locally inspired cuisine, featuring fresh seafood and local farm sourced ingredients. The Henderson also offers wide selection of venue settings for weddings, special events and meetings. When you arrive at The Henderson’s stunning entrance, you will discover an unforgettable experience where every moment is a gift. Transformative, beautifying, edifying, and nurturing are just a few of the words that describe Salamander Spa. Known for treatments that celebrate the art of healing and provide the ultimate in pampering, Salamander’s experienced and talented therapists and aestheticians –and its innovative treatment menu– insure that your precise wellness needs are met and your experience exceeds your expectations. In addition to exquisite treatment rooms, the spa has a wet area with an experiential shower, whirlpool tub, a luxurious couples’ suite, sun-lit relaxation spaces, and a full-service salon, featuring hair design, makeup, and hair and nail services Spa guests are also invited to enjoy additional resort amenities or simply lounge in luxury. In addition to one of the most breathtaking stretches of sand in the world and the emerald waters of the Gulf of Mexico, the Henderson Beach Resort offers an endless list of activities and attractions. The full-service fitness facility features indoor and outdoor workout areas, a family-friendly pool with a tranquil lazy river and quiet adult zone, and beachside-yoga and fitness classes. Guests are also invited to enjoy art experiences, special holiday activities, bike adventures, paddle boarding and nearby golf, fishing, shopping, museums and festivals. Poppy’s Kids Club is a great escape for children from age four to eleven. In addition, Henderson’s experienced event staff can help you create a storybook wedding, special celebration, or a meeting in an iconic setting. The resort is also dog friendly. In addition to beautifully designed and spacious guest rooms and suites–all with stunning views– you can relax in a special spa room with a private elevator to the spa, premium amenities, luxurious bedding and designer touches. All rooms are larger than typical luxury hotel rooms and include wireless Internet access. During your stay, you can choose from five dining experiences, from an elegant full-service restaurant with Gulf views, a soaring bar with panoramic Gulf and preserve views, a convenient poolside grill, a tasty sushi bar, a relaxing outdoor terrace dining featuring sunset views and an old-fashioned ice cream shop.